Finding Our Place in the Solar System gives a detailed account of how the Earth was displaced from its traditional position at the center of the universe to be recognized as one of several planets orbiting the Sun under the influence of a universal gravitational force. The transition from the ancient geocentric worldview to a modern understanding of planetary motion, often called the Copernican Revolution, is one of the great intellectual achievements of humankind. This book provides a deep yet accessible explanation of the scientific disputes over our place in the solar system and the work of the great scientists who helped settle them. Readers will come away knowing not just that the Earth orbits the Sun, but why we believe that it does so. 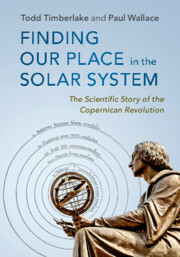 The Copernican Revolution also provides an excellent case study of what science is and how it works. Preface; 1. Introduction: mysterious skies; 2. Two spheres: modeling the heavens and the Earth; 3. Wanderers: the Moon and the planets; 4. An Earth-centered cosmos: astronomy and cosmology from Eudoxus to Regiomontanus; 5. Moving the Earth: the revolutions of Copernicus; 6. Instruments of reform: Tycho's restoration of observational astronomy; 7. Physical causes: Kepler's new astronomy; 8. Seeing beyond Aristotle: Galileo's controversies; 9. The system of the world: Newton's universal physics; 10. Confirming Copernicus: evidence for Earth's motions; Appendix A. Mathematical details; Notes; References; Index. Todd Timberlake has taught physics and astronomy at Berry College, Georgia since 2001. He teaches courses on the Copernican Revolution, the history of galactic astronomy and cosmology, and extra-terrestrial life, among others. Although he usually teaches college students, he has taught audiences ranging from kindergarten children in the USA to Tibetan Buddhist monks in India. He is passionate about incorporating the history and philosophy of science into the teaching of science and he is an expert at using computers as a tool for teaching physics and astronomy. Paul Wallace teaches physics and astronomy at Agnes Scott College in Decatur, Georgia. His scientific work was in experimental nuclear physics and gamma-ray astrophysics, but his love of the history of astronomy drew him away from technical research. His unusual background and informal approach make him a sought-after speaker at churches, conferences, colleges, and retreats. His first book, Stars Beneath Us: Finding God in the Evolving Cosmos, was published in 2016.